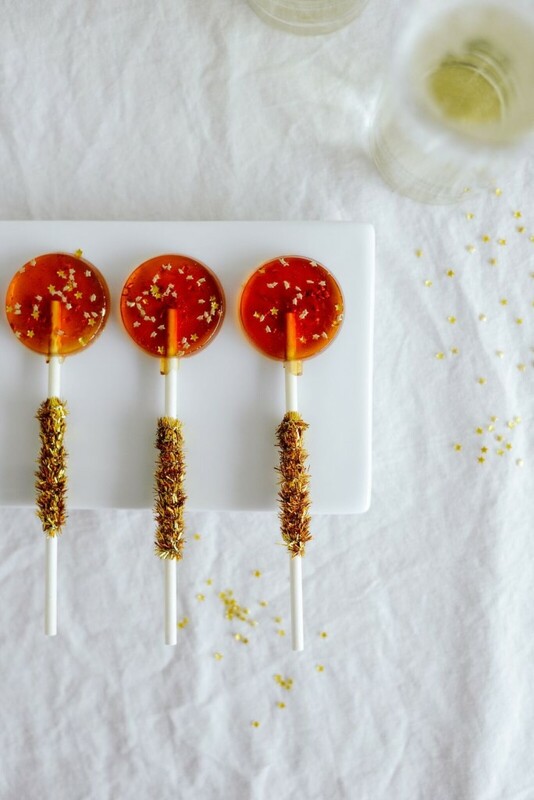 Add a bit of gold tinsel and you have yourself a party on a stick! 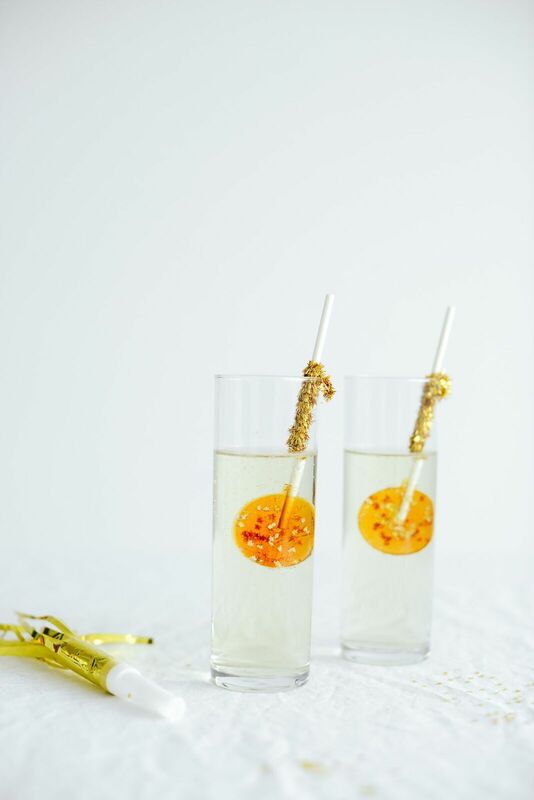 The tinsel is optional, but it does create an easy way to hold your champagne lollipops onto your drinking glass. Dipping them into your glass of champagne is definitely a serving suggestion I recommend! Mix the champagne, water, sugar, corn syrup, and salt together in a saucepan. Bring the mixture to a boil over medium heat and stir occasionally until all of the sugar is dissolved. Clip a candy thermometer onto the side of your saucepan. Without stirring, allow the mixture to boil until it reaches 300°F. (A candy thermometer is definitely a big factor with this recipe! I’ve had to re-make the recipe a few times previously because I wasn’t using the correct thermometor and my batch burned. It is SUPER easy to burn your sugar. The mixture will continue to heat after it’s removed from the stovetop, so to be safe, remove a few degrees prior to ensure you don’t have to remake it like I did). 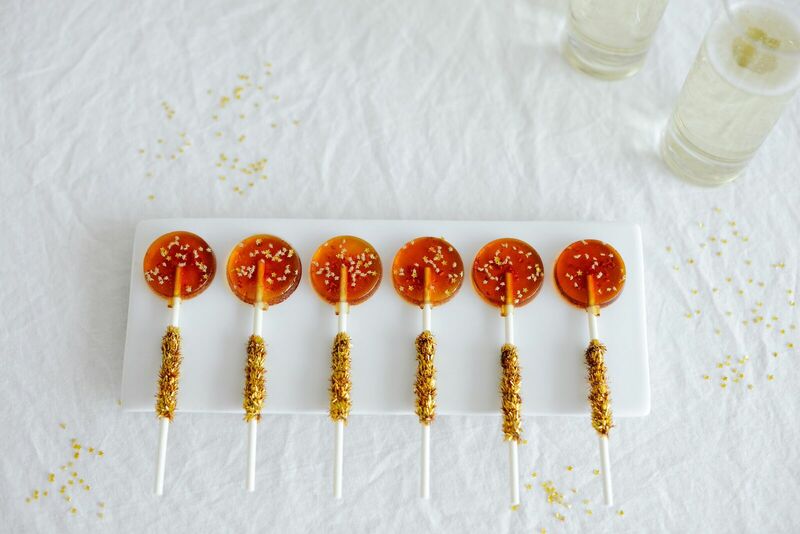 Remove the mixture from the heat and quickly drop it into a lollipop mold sprayed with cooking spray. Using a spoon to drop the liquid sugar helps to keep it mess free and easy. 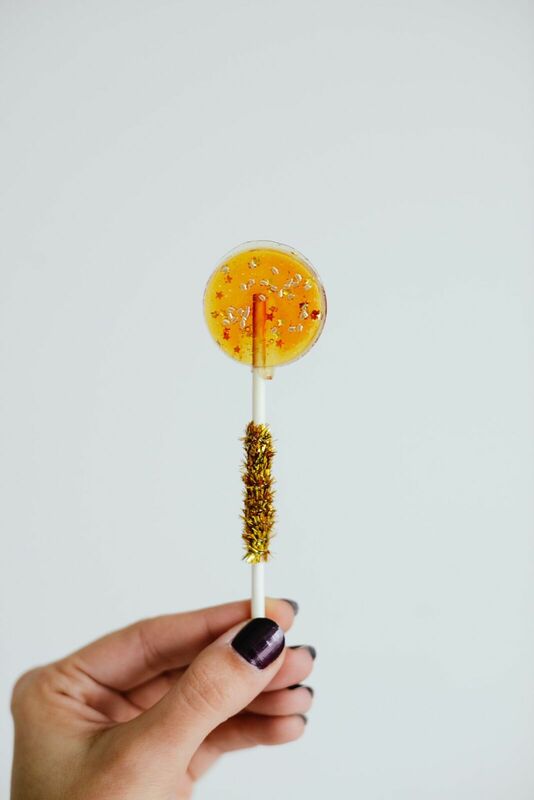 Place a lollipop stick into the center of each pop and twist it around so that it’s fully covered in syrup. 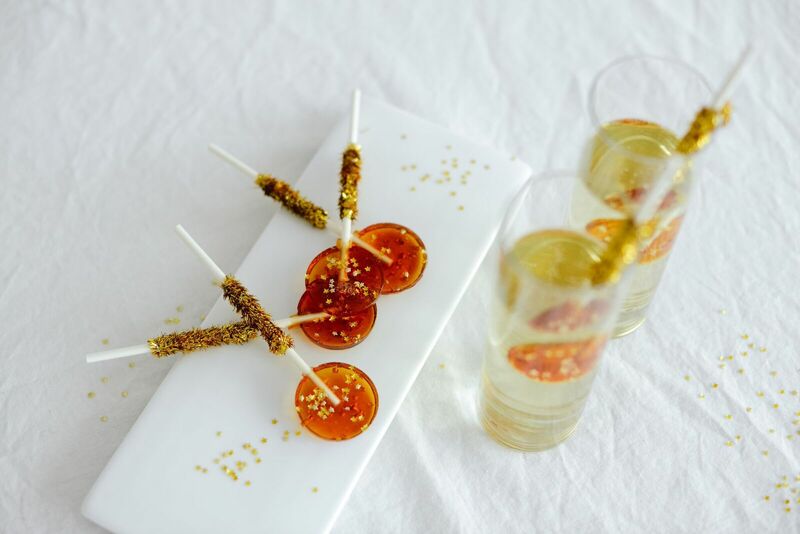 Sprinkle some edible confetti onto the pops while dying, for a fun festive touch. Allow the pops to cool completely before removing from the mold. Store them in an airtight container until ready to eat! 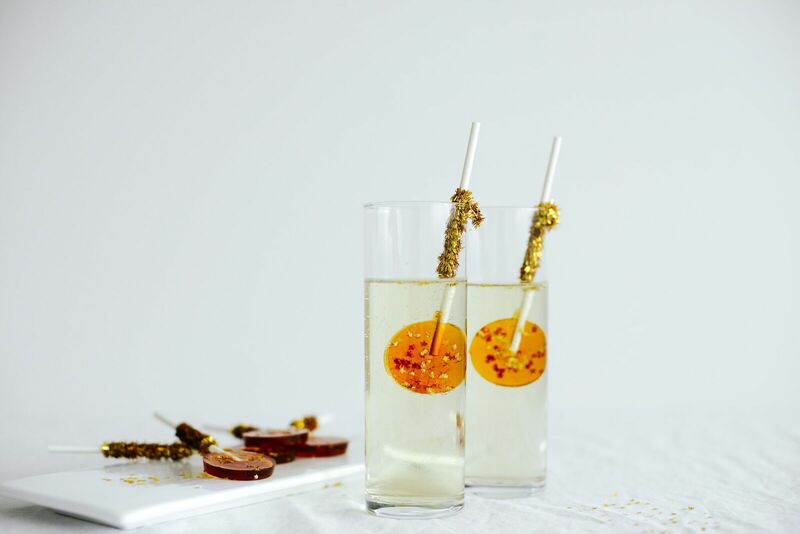 If you want to add a little bit of pizzazz to your champagne lollipops, wrap a gold tinsel pipe cleaner around the center of your lollipop sticks. It also creates a great way to hang your pops onto a glass of champane if you’re planning to serve these guys at a party. The goal is to get your pops clear, but even I learned that this takes a lot of practice! It’s really easy to overcook your sugar, so don’t rush the process, but don’t wait until it’s too late either. It’s a skill that I definitely admire and one I am going to perfect in 2016!